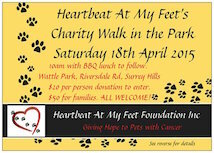 A Charity Walk to raise money to help raise funds for pets with cancer! A leisurely walk in the park followed by a BBQ lunch to raise funds to assist with cancer treatment for animals & honour pets lost to cancer. $20 entry fee per single. $50 per family (up to four people). BBQ lunch & drinks also available to purchase.